Just a very quick post, to describe a problem recently experienced at a customer. Enter Extranet Lockout. By implementing this as a policy on the AD FS server, we can stipulate that after x number of invalid logon attempts via the Web Application Proxy, not to forward further requests to Active Directory, thereby protecting that account from lockout. For example, if our AD account lockout policy stipulates lockout at 10 logon attempts, we set our AD FS extranet policy at a lower value, say 5. All good. There is a caveat though. Extranet Lockout capability does introduce a direct dependency between ADFS and the PDC Emulator Active Directory FSMO role. If you do plan on using this feature it’s worth considering this. Otherwise, extranet lockout may occur for very different reasons Connectivity between the AD FS farm and the Domain Controller hosting this role is assumed. Should the situation arise where network connectivity between the two is broken, then users will be unable to logon at AD FS. This applies even where local domain controllers are co-located next to AD FS. It turns out that the PDC Emulator must be contacted on each logon attempt. This sort of issue can arise in an enterprise (e.g. global) setup, where AD is distributed, living in different data centers; the AD FS services in one and FSMO roles in another. However, the PDC Emulator role, hosted on a single domain controller, does introduce a single point of failure. FSMO roles can be seized or transferred, though this requires manual intervention. A good monitoring setup can also help reduce potential downtime by way of monitoring the PDC emulator or more specifically, the server running underneath it. Monitoring AD FS service health can also help identify problems if the tool used is capable of checking logon with a synthetic transaction (e.g. testing login with a SOAP message against a WS-Trust endpoint). Nonetheless, the fact remains that with the feature enabled, this represents a single point of failure into your AD FS setup. You’ll need to evaluate organizational requirements (security v availability) and whether the individual protection offered by Extranet Lockout outweighs the possible service availability impact that arises through failure of the server hosting the PDC Emulator. 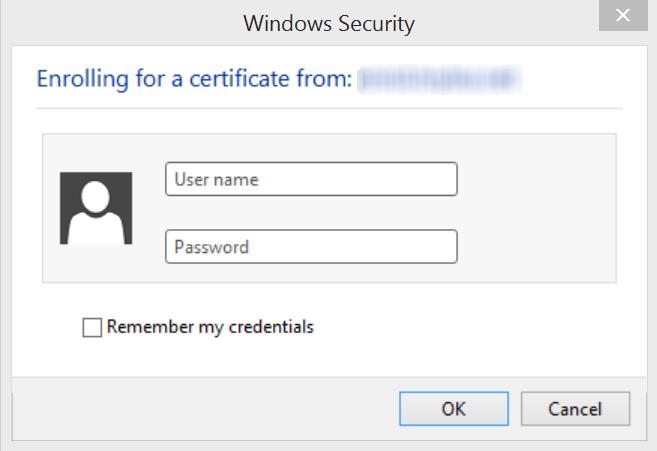 There have been questions on this subject posted recently to comments and also on the TechNet forums, so I just wanted to quickly write up something about use of client certificates in the MFA (secondary) slot in AD FS 2012 R2. You may recall from earlier AD FS R2 posts, that we used virtual smart card and smart card as examples. Let’s broaden that to include “soft” client certificates as an MFA/secondary provider. This functionality is provided “out-of-the box” in AD FS 2012 R2. An Active Directory Certificate Services (AD CS) infrastructure is required to serve up certificates for enabling users for PKI. 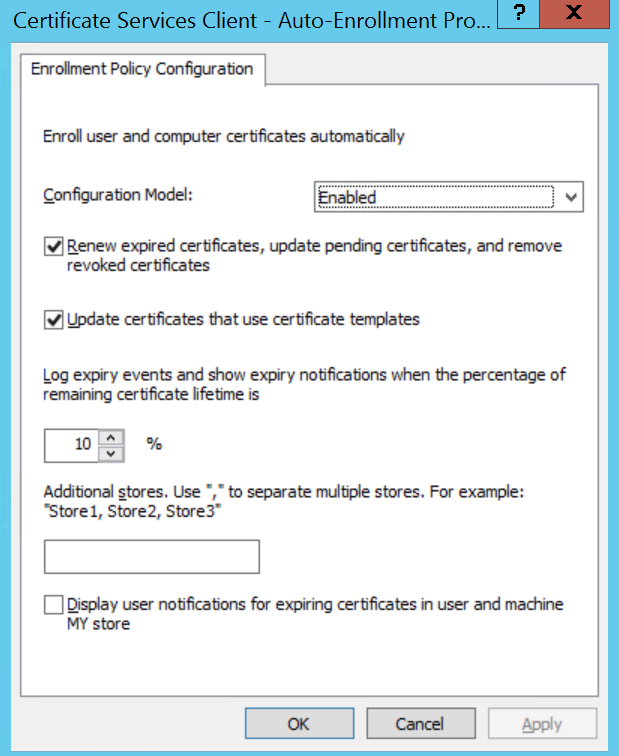 In this post, I’ll be using an Active Directory Certificate Services (AD CS) role from Windows Server 2012 R2 as the Certification Authority (CA). I won’t be explaining the CA setup, beyond the templates used, as there’s been plenty of ink expended on this topic already on the Internet. A Windows 2003/2008/2012 CA setup will suffice for the activities concerned here. a domain-joined machines, via an auto-enrollment policy User-Context GPO. In AD Certificate Services (AD CS) a duplicate of the default User certificate template was made (called User V2). Under the Application Policy, the policy is limited to Client Authentication. For domain-joined clients, we can enable auto-enrollment via the security tab of the template. 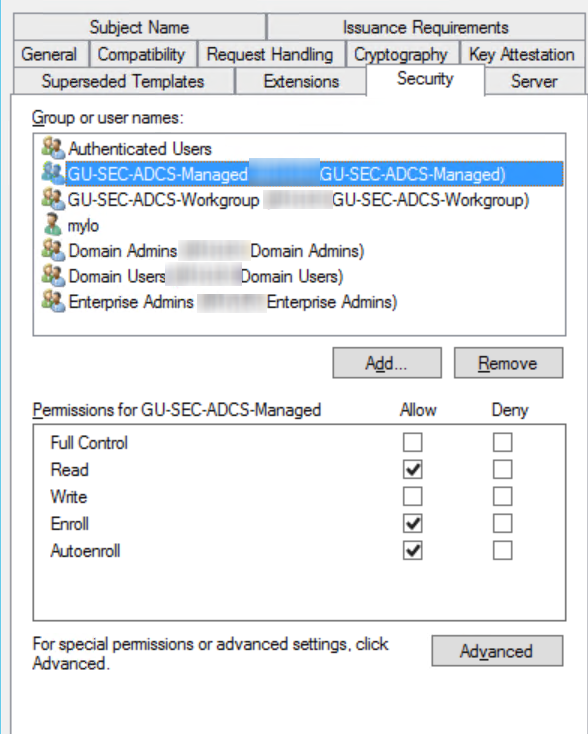 Here we see a group called GU-SEC-ADCS-Managed, which is given the necessary read, enroll and autoenroll permissions and we can add users to that security group. To enable auto-enrollment for domain-joined clients we need to activate a policy to accomplish this. Against best practices (boo), but for expediency (mine.. yay! 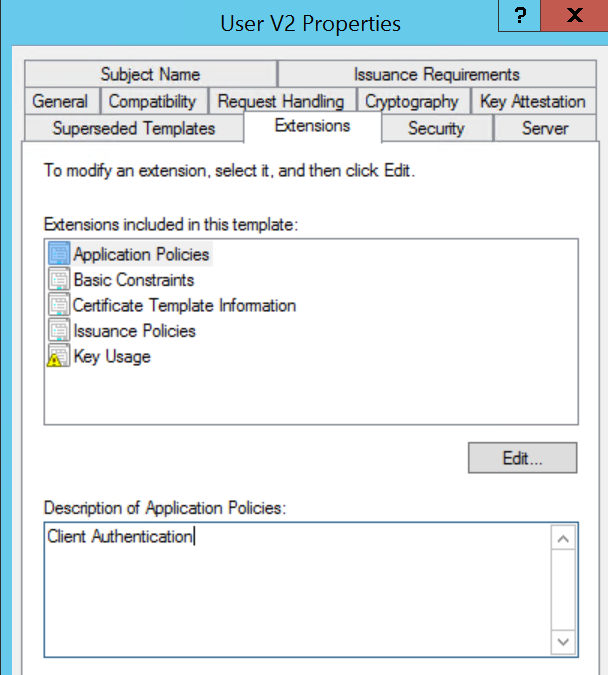 ), I enable the policy in the Default Domain Policy GPO. The actual settings can be find under Windows Settings|Security Settings|Public Key Policies. Select the Certificate Services Client – Auto Enrollment object and enable the Configuration model section as seen below. For the non-domain joined client, read and enroll permissions are given to a group I’ve called GU-SEC-ADCS-Workgroup. The test user, who will be a member of that group, can request the UserV2 certificate template via the Certificates|User MMC plug-in using AD CS Certificate Enrollment Web Services. Again, I won’t be describing how to setup enrollment web services. If you need help, just post in the comments section. 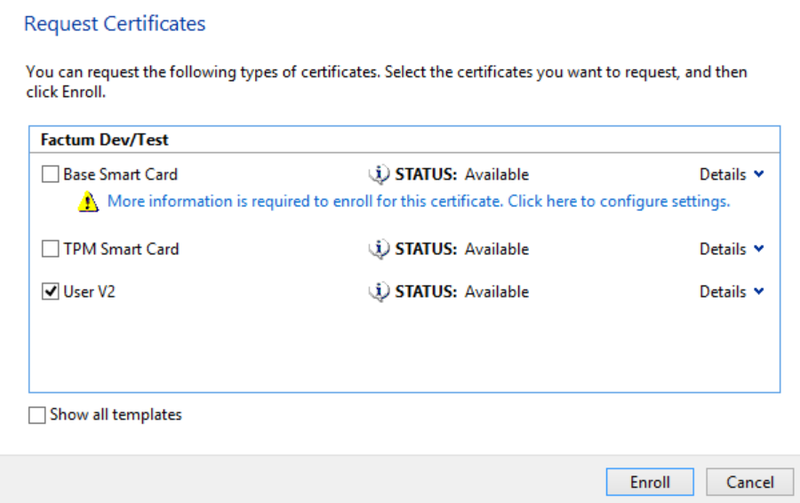 With Certificate Services, we need to make available the template available to both sets of clients, by enabling the template in the Certification Authority MMC plugin – Certificate Templates|New|Certificate Template to Issue. In a correctly configured setup, domain-joined clients will obtain a certificate on the next GPO refresh cycle for the user (e.g. logon). User V2 is the template we just created for use for “soft” client certificates.The certificate services enrollment point in this example is configured for Username/Password authentication. Logon is done with a test AD user account training@azuresprout.net, who is a member of the GU-SEC-ADCS-Workgroup and authorized with the enroll permission. 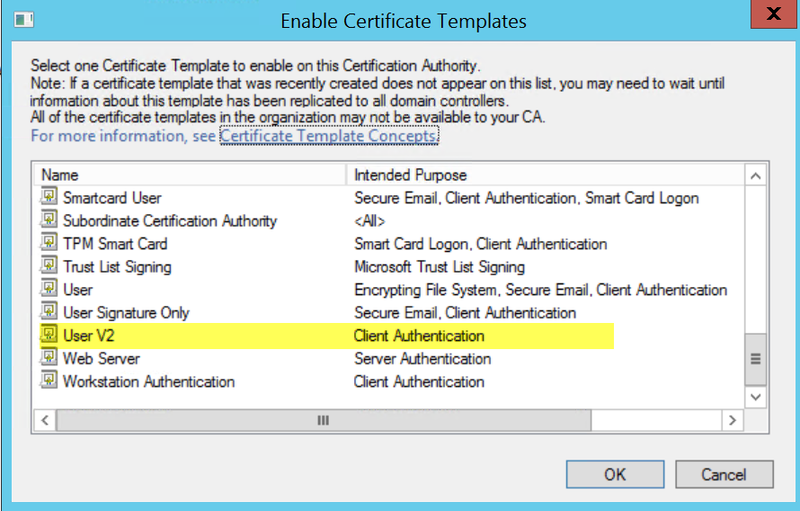 Once that’s done, a client certificate is installed in the user context. On the AD FS side of things, let’s assume we now need to apply MFA for users (with client certificates) coming from the Internet. 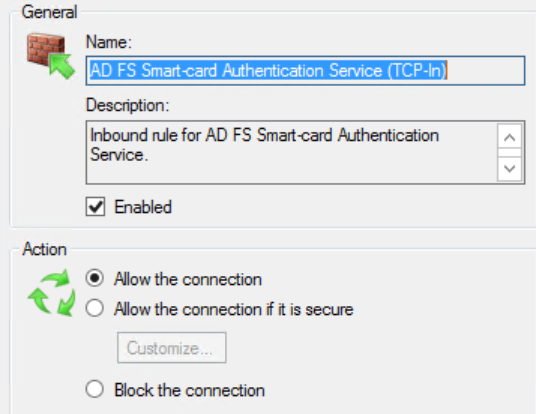 Before we jump into the actual AD FS settings, it’s worth mentioning that any firewalls in front of the Web Application Proxy (WAP) will need to allow port 49443/TCP inbound, as this is the port the AD FS Smartcard Authentication Service listens on. We see evidence of this requirement in the Windows Firewall snap-in. AD FS creates a firewall rule during the installation allowing 49443/TCP inbound. Note that at this point, I’m not enforcing the use of MFA globally, rather enabling it for use at a lower level on a relying party rule, for more incremental control. Whether to go for global or granular policies really boils down to a question of fit and the use cases may need to support. .
On a test Windows Identity Foundation (WIF) relying party, MFA is enforced for externally connecting users. Logging on to the relying party, we hit the primary authentication handler (AD FS forms), enter our username/password. Connecting from the Internet, with MFA enabled, the secondary (MFA) authentication handler kicks in and we’re presented with a login popup. In the above graphic, we have an option to login with a virtual smart card (top) and an X509 client certificate (bottom). 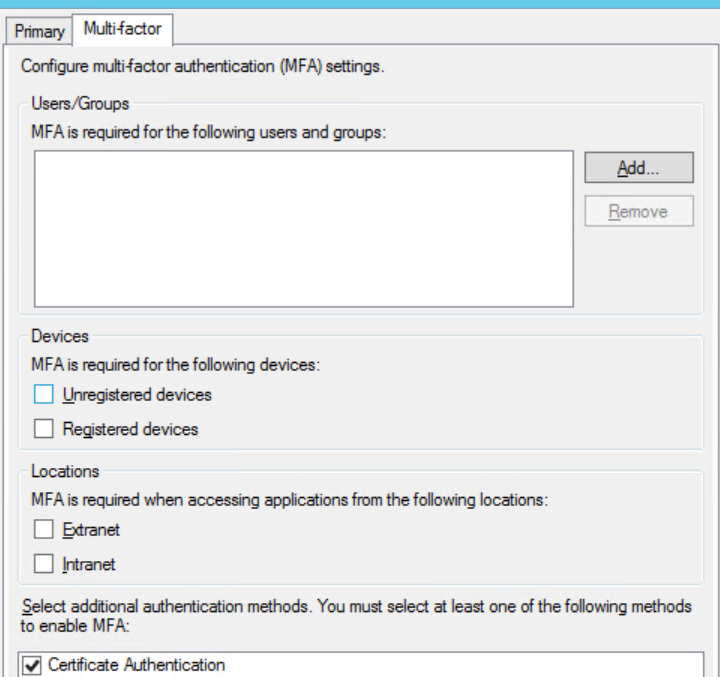 Click on the certificate and AD FS will authenticate the user using secondary authentication (MFA). The enrolled certificate is stored by AD CS in the userCertificate attribute of the user object within AD. This attribute contains the DER-encoded X509v3 certificates issued to the user. We can lookup the necessary certificate reference, for example, in the Attribute Editor of AD Users & Computers (ADUC). This is a multi-valued attribute. 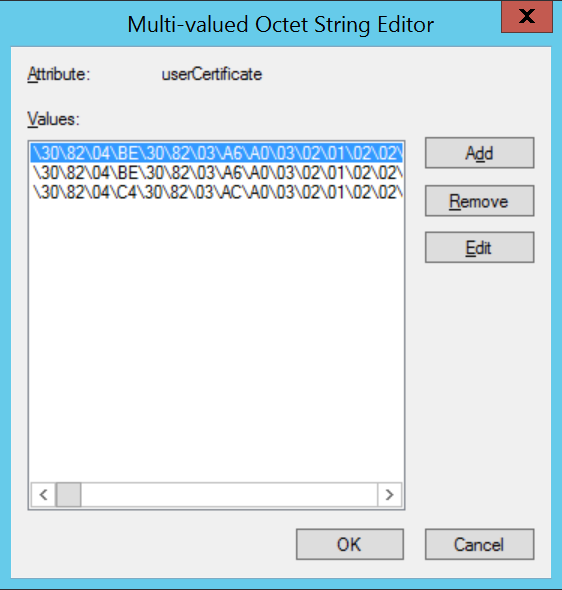 One thing that can be useful, should you be working with multiple certificates for a given user, is being able to cut and paste the hex encoded value into Notepad, save it, then check to see what the certificate value corresponds to using CERTUTIL. We can then open the .cer file to see what the certificate is. We can see the relevant authentication method references processed during primary and secondary logon. As I mentioned in an earlier post, the nice thing here is that you can use the Enhanced Key Usage (EKU) claim emitted for both client certificates and smart cards / virtual smartcards to moderate access to resources as you see fit. Looking at a user authenticating with a client certificate, the following EKU is emitted as a claim. Access can also be further graded by using custom OIDs to differentiate between levels of access based on the type of MFA being used and the EKU value. Use of certificates in the MFA slot in R2 (I suspect) are really geared for use in a true two-factor (2FA) authentication capability, i.e. smart cards. While the use of a client certificate does offer value in offering richer access possibilities, this is not 2FA, in that it does not satisfy the mantra of “something I have and something I know”. Instead, this is more akin to 1.5FA. To finish up, Microsoft recently added support in Windows 7 for domain-joined clients via a hotfix. 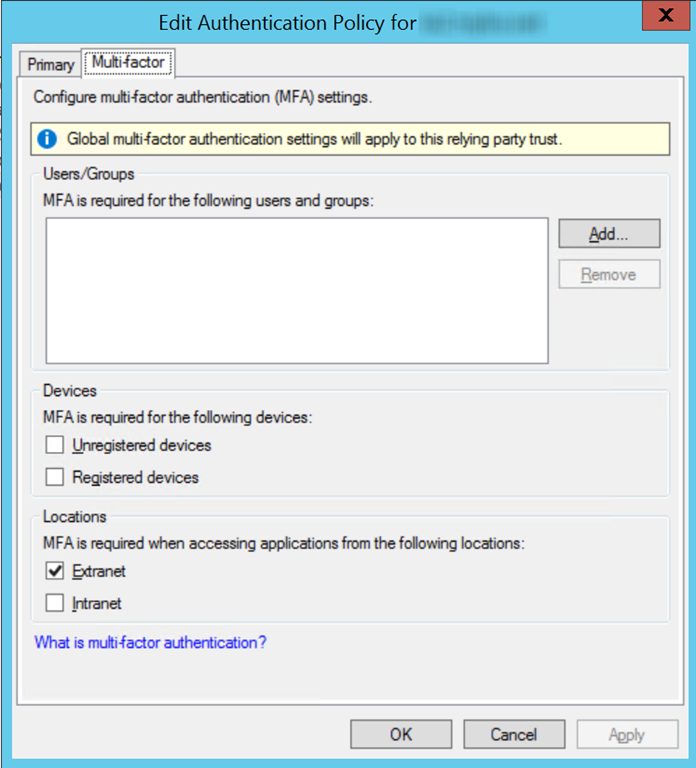 I’ll attempt to throw out a quick post on this, but in the meantime, I’ll be following up by looking at conditional access policies for MFA. As always, thanks for reading and if you have any questions, please post a comment and I’ll do my best to answer quickly.